Hubspot Academy‘s online courses provide a formal training structure with interactive tests. Its a lovely interface with bitesize videos explaining every aspect of the system. 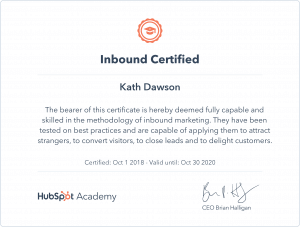 My approach to creating digital marketing strategies is very much aligned with Hubspot’s approach so learning their system is a natural next step. Additional motivation is that I want to do more hands-on work with Hubspot both for myself and for my clients. I work with many B2B clients who could benefit from marketing automation systems and in the last 12 months I’ve helped 3 clients appoint Hubspot Partner Agencies to grow their businesses all of which are flying as a result. I want to be able to support clients who want to manage their Hubspot implementation themselves but need some occasional or ongoing strategic support. They may have worked with an agency and it didn’t work out or they just don’t have the funds to pay thousands in retainers. The first certification involves fully understanding Hubspot’s inbound methodology. You do that by attracting prospects and customers to your website through the relevant and helpful content that you publish. Once visitors arrive, you engage with them using conversational tools such as email and chatbots and by promising continued value. The final stage in the process is delighting them by continuing to act as an empathetic advisor and expert. Inbound marketing is all about creating content designed to address the problems and needs of your ideal customers, your personas, so that you attract qualified prospects and build trust and credibility for your business. 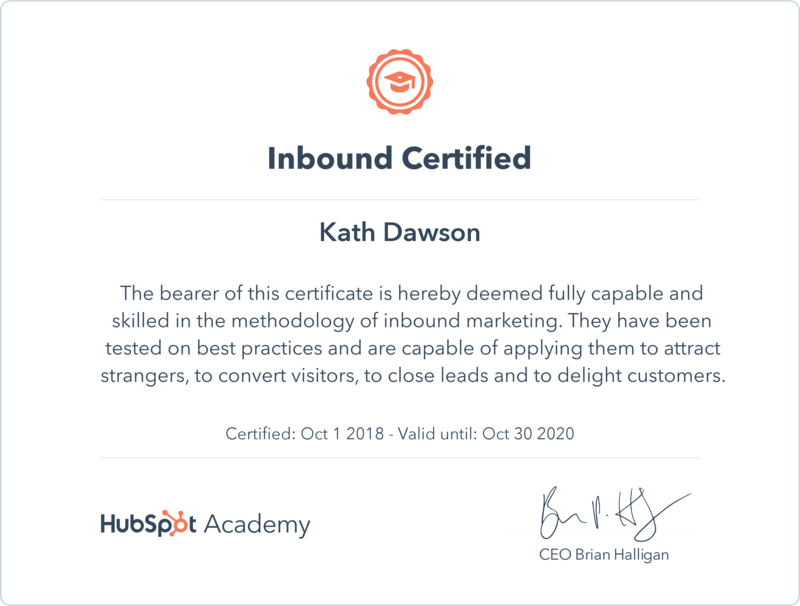 Hubspot provides a framework to design and implement your inbound strategy plus it provides all the tools for managing and measuring success. Its not the only tool on the market that will make this easier, and you don’t even need tools at all to implement an inbound strategy, but tools certainly make it more fun and allow you to achieve more with less. Hubspot, or equivalent, is a perfect solution for busy B2B marketing professionals to support their digital marketing strategies. I’m going to carry on working my way through the Academy Training modules and gaining more experience. If you have any questions about how your inbound marketing strategy could be improved drop me a line and we can chat it through.